From appetizers to aperitifs, this Rosh Hashanah menu incorporates all the symbolic foods of the Jewish New Year into the perfect holiday meal. This roasted salmon dish is the perfect starter for your Rosh Hashanah meal — and a nod to the Jewish tradition of eating a fish headas an omen of fertility for the coming year. Make salsa by combine first 6 ingredients, seasoning with salt and pepper to taste. Cover and chill. Place salmon skin side down on a baking sheet. Brush with olive oil or spray with a thing coating of PAM Spray. 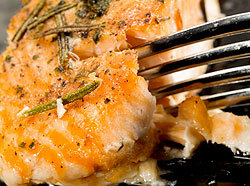 Bake fish until the center is opaque, about 25 minutes. Transfer to a serving plate, top with chilled salsa and serve. Visit our holiday recipe site, Holiday Eats, for these additional, and delicious Rosh Hashanah recipes. Jews of Middle Eastern-descent traditionally eat squash, gourd and pumpkins on Rosh Hashanah. This delicious squash recipe uses some of the holiday’s most popular ingredients to make a sweet stuffing. Bake this classic Rosh Hashana favorite in a bundt pan for an elegant presentation.